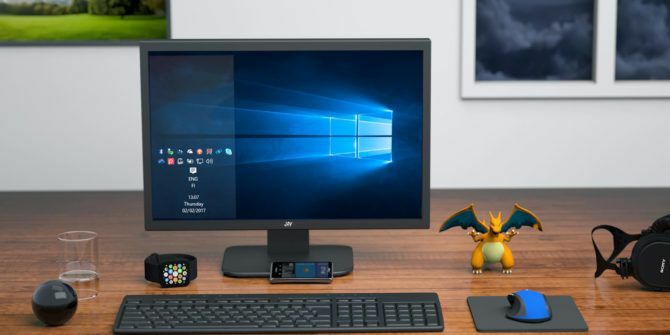 There are many basic features that should’ve shipped with Windows 10 5 Lost Features You Can Resurrect in Windows 10 5 Lost Features You Can Resurrect in Windows 10 Windows 10 is quite different and chances are you're missing a few familiar features. Did you lose Windows Media Center, DVD support, or classic games during the upgrade? We may have a solution for you! Read More but aren’t available. Fortunately, third-party developers are picking up Microsoft’s slack, and one of these gaps is the incredibly simple task of rearranging stacked windows in the Taskbar. 7+ Taskbar Tweaker is a handy little program full of features that are missing in Windows, including the stack-rearranging functionality mentioned above. And while the name may lead you to believe it only works on Windows 7, it is compatible Windows 10. After you install 7+ Taskbar Tweaker, under Taskbar items > Thumbnails, make sure that Drag to reorder is checked. Once that’s done, you can hover over stacked windows in your Taskbar to pull up the thumbnails for all the windows in that stack. Just click and drag the thumbnails into the order you want them to appear. This is particularly useful for apps like Chrome, where you frequently keep multiple windows open and Windows offers no choice but to keep them stacked. But if you prefer to not install yet another utility program, there is a second option: the Merge Windows extension. After installing this extension, just click the Merge Windows button and all your tabs will be merged into one window. You can then drag and drop tabs into new windows in the desired order. You can manually drag tabs into new windows without the extension, but it’s more tedious. Do you have any tips or tricks for how to reorder Chrome windows in the Windows taskbar? Let us know in the comments. Explore more about: Windows Taskbar, Windows Tricks.